The thing is, you do. There’s plenty of time to do so if you just create a little bit each day. Notice the words ‘little bit’ in that last sentence? Those are key. You need to realize that you aren’t going to write the next Great American Novel of paint the next Mona Lisa in a day. Things like that take time. Lots of time. But there are ‘little bits’ of time each day where you can create and if you are able to get yourself to do that every day, those little things will build up into big things. A year or so ago I made a commitment to myself to do at least one creative thing a day, no matter how big or small. Some days the creative thing is just some sketches on the Paper app on my iPad. Sometimes the creative thing is some writing on a script or one of my novellas that I never get around to editing. Sometimes the creative thing is a stand up show. The point is that I wake up each morning and say to myself, “Today I’m going to do at least one thing that is creative no matter how small.” And I’ve found that if I do that, I get it done. Some days, I get a whole day to work on creative projects. Mostly though, I’m taking time out before bed or early in the morning to work on creative projects. The thing is, stuff gets done. There’s that old saying, “Slow and steady wins the race.” It’s true. If you work on your creative project a tiny bit each day, eventually it’ll get done. Writing two hundred and fifty words a day, every day, for a year is ninety one thousand two hundred and fifty words a year. That’s a novel right there folks. You’ve just written a novel in a year. You are going to discover that I usually look at things from a writer’s standpoint. Writing two hundred and fifty words takes me about 20 minutes or so (I never said they were good words). Looking at other disciplines, what if you painted for twenty minutes each day? Or practiced piano for twenty minutes a day? That’s seven thousand three hundred minutes a year. One hundred twenty one hours (and some change) a year. What could you create in that time? I completely understand that you may not have twenty minutes a day. How about ten? How about five? And that’s not even the best part. Imagine how good you’ll feel when you commit to creating each and every day. Knowing that your art, your passion, is getting done and you’re keeping your creativity alive. 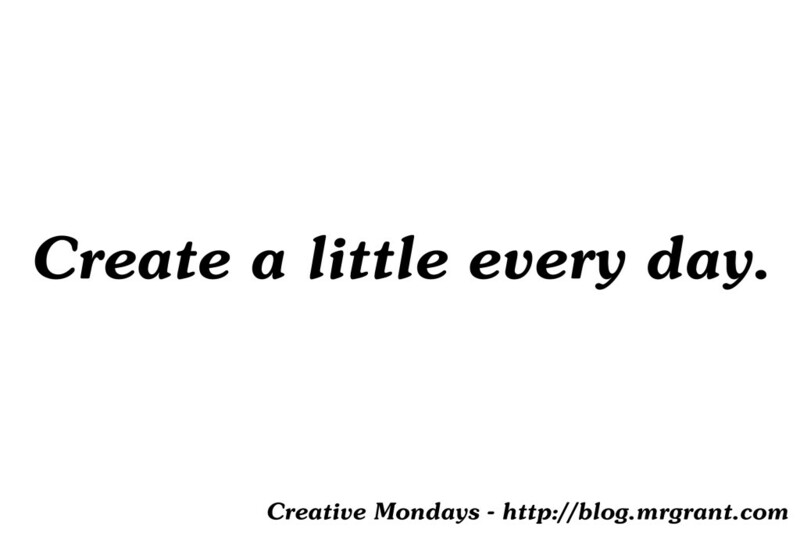 This week I want you to try and challenge yourself to work on your create project a little each day. Even if it’s five or ten minutes, find some time each day to work in a little creative fun. How did it go? Were you able to do it? Let me know in the comments below.